The Egyptian pyramids are ancient pyramid-shaped masonry structures located in Egypt. As of November 2008, there are sources citing both 118 and 138 as the number of identified Egyptian pyramids. Most were built as tombs for the country’s pharaohs and their consorts during the Old and Middle Kingdom periods. 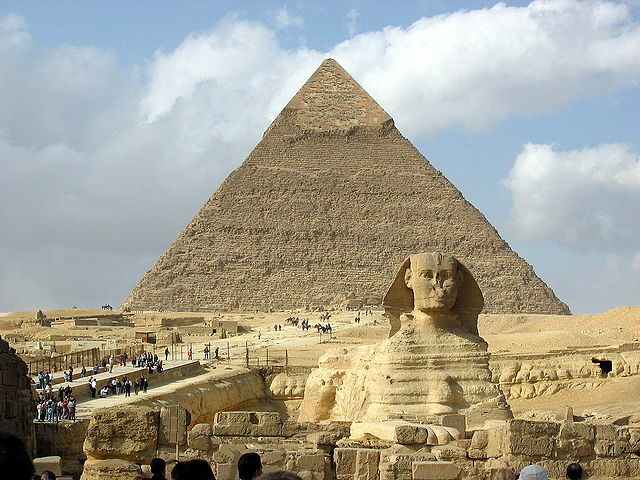 The most famous Egyptian pyramids are those found at Giza, on the outskirts of Cairo. Several of the Giza pyramids are counted among the largest structures ever built. The Pyramid of Khufu at Giza is the largest Egyptian pyramid. It is the only one of the Seven Wonders of the Ancient World still in existence. In 1842 Karl Richard Lepsius produced the first modern list of pyramids – see Lepsius list of pyramids – in which he counted 67. A great many more have since been discovered. As of November 2008, 118 Egyptian pyramids have been identified. Abu Rawash is the site of Egypt’s most northerly pyramid (other than the ruins of Lepsius pyramid number one) the mostly ruinedPyramid of Djedefre, son and successor of Khufu. Originally it was thought that this pyramid had never been completed, but the current archaeological consensus is that not only was it completed, but that it was originally about the same size as the Pyramid of Menkaure, which would have placed it among the half-dozen or so largest pyramids in Egypt. Giza is the location of the Pyramid of Khufu (also known as the “Great Pyramid” and the “Pyramid of Cheops”); the somewhat smaller Pyramid of Khafre (or Kephren); the relatively modest-sized Pyramid of Menkaure (or Mykerinus), along with a number of smaller satellite edifices known as “Queen’s pyramids”; and the Great Sphinx. The Giza Necropolis has been a popular tourist destination since antiquity, and was popularized in Hellenistic times when the Great Pyramid was listed by Antipater of Sidon as one of the Seven Wonders of the World. This site, halfway between Giza and Abu Sir, is the location for two unfinished Old Kingdom pyramids. The northern structure’s owner is believed to be pharaoh Nebka, while the southern structure, known as the Layer Pyramid, may be attributable to the Third Dynasty pharaoh Khaba, a close successor of Sekhemkhet. 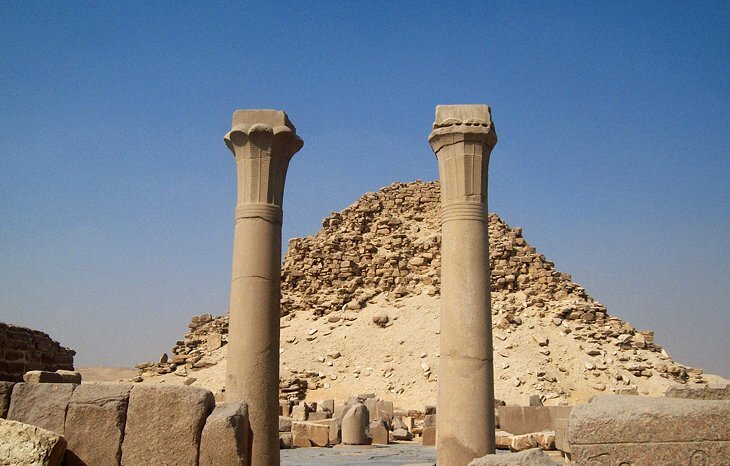 There are a total of fourteen pyramids at this site, which served as the main royal necropolis during the Fifth Dynasty. The quality of construction of the Abu Sir pyramids is inferior to those of the Fourth Dynasty. The three major pyramids are those of Niuserre, which is also the best preserved, Neferirkare Kakai and Sahure. 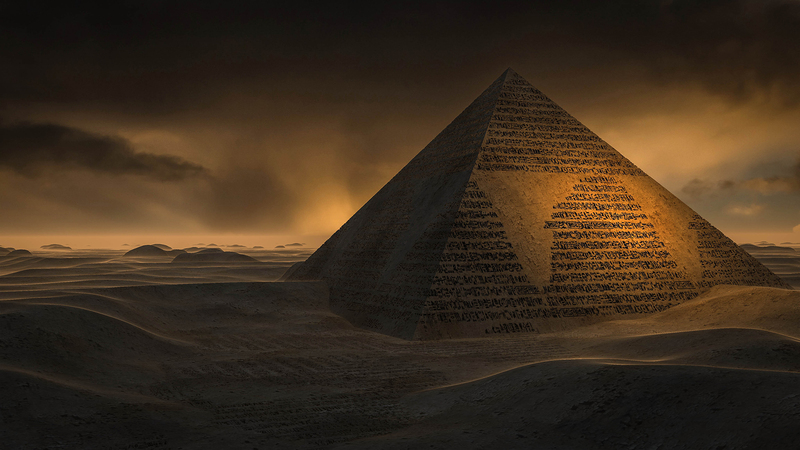 The site is also home to the incomplete Pyramid of Neferefre. Most of the major pyramids at Abu Sir were built similar construction techniques, comprising a rubble core surrounded by steps of mud bricks with a limestone outer casing. The largest of these 5th Dynasty pyramids, the Pyramid of Neferirkare Kakai, is believed to have originally been built as a step pyramid some 70 m (230 ft) high and then later transformed into a “true” pyramid by having its steps filled in with loose masonry. Major pyramids located here include the Step Pyramid of Djoser – generally identified as the world’s oldest substantial monumental structure to be built of dressed stone – the Pyramid of Userkaf, the Pyramid of Teti and the Pyramid of Merikare, dating to the First Intermediate Period. Also at Saqqara is the Pyramid of Unas, which retains a pyramid causeway that is one of the best-preserved in Egypt. Together with the pyramid of Userkaf, this pyramid was the subject of one of the earliest known restoration attempts, conducted byKhaemweset, a son of Ramesses II.